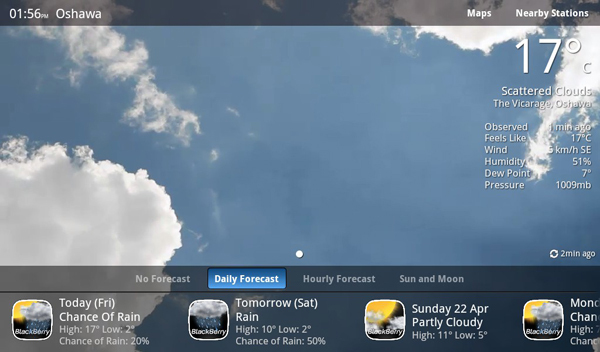 BeWeather HD for the BlackBerry PlayBook is fantastic - Check out our review to see why! 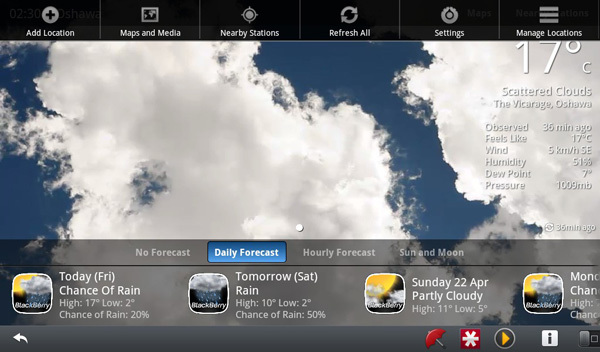 BeWeather HD for the BlackBerry PlayBook is a feature-rich weather app that really stands out in both looks and functionality! If waking up in the morning and checking the weather is something you've become addicted to you, will definitely want to check out a new PlayBook application called BeWeather from Bellshare. BeWeather is an all-in-one weather app that not only gives you the current and future weather forecasts, it does so in a visually appealing way. You’ll want to follow me after the break to read the full review on one of the best weather apps currently available for the BlackBerry PlayBook. BeWeather was originally made for BlackBerry smartphones and then an Android verison was created and ported to the PlayBook, which is what we will be looking at in this review. As a recap, with the power of PlayBook OS 2.0, Android developers are able to seamlessly port their applications from the Android environment onto the PlayBook Android Runtime. Doing so allows devs to quickly get their apps onto the PlayBook and future BlackBerry 10 devices with very little work. If both form and function are things that you look for in applications for mobile devices then you’ll want to have a look at BeWeather on the BlackBerry PlayBook. BeWeather gives you the ability to add an animated background, one that changes dynamically with the current weather conditions in the area. Not only can you add the videos to play you are also able to have a custom image or color in place, a small feature but it lets you customize your in app experience. BeWeather features a bottom pane that houses four options for displaying the current and future forecast. You have the option to not show anything, to show daily forecast, the sun and moon cycles, and hourly forecasts for those looking to be on the leading edge. Replace/extend the default radar/satellite maps with your preferred weather service's radar maps! While there are a lot of options for various views on the home screen BellShare had done a fantastic job at making it all flow and allowing you to get from one bucket of information to another with very little effort. One thing I did wish was that they had made an option to have the forecast bar a little larger. Right now it is easy to read but visually it would add a little extra by giving you the option to have it take up the whole screen with the animations in the background. When you swipe from the top bezel you are presented with 6 options to chose from. From these options you can add a location, view maps and media, check nearby stations, refresh all locations, access to the main settings page, as well as manage locations. Because most of those are quite self-explanatory, I’m going to look at the full settings page to see what can be changed to make the BeWeather experience a little more personal. 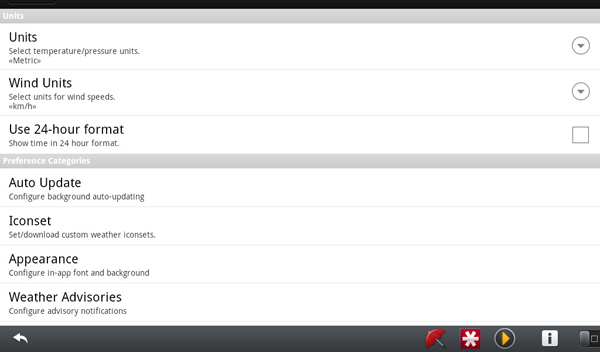 Within the settings page you will find a small stash of options and settings to customize your BeWeather experience. First and foremost you are able to change the measurement units, definitely a must for those who are not on the Imperial system. From there you are able to change the font, color of the text, whether the background is animated or not, as well as the over all appearance of the weather screen. Looking through this page I didn’t really see a setting that was missing or that was unneeded, so feel free to poke around and change up the look and add some custom weather icons. Definitely one of the best weather applications that is currently available on the BlackBerry PlayBook. Visually BeWeather keeps you entertained with animated backgrounds, smooth transitions and enough options to customize your weather experience you couldn’t have asked for any more. While I love the app there are a few things that have bothered me and a few things that I think could make nice additions to the application. The biggest issue I found with the application (but it could possibly be the PlayBook Android player) was the occasional message letting me know that the application had to quit and will need to be restarted. The other issue is that by downloading the animations you are also putting the videio files needed for this application into your video folder causeing them to show in the video player, but I'm sure this is an issue with the PlayBook and not BeWeather. There were also a few features that I felt could be added to the application. One would be the ability to expand the forecast pane, allowing the user to make it larger or even cover the whole page if they wanted. Also I was hoping that BellShare would have used the GPS in the PlayBook to locate the closest city, but maybe that’s coming in a future update. As the app space on the PlayBook heats up developers will need to up the ante and bring their best game, and while this is only an Android port you can tell that the developer has an understanding of what the users are looking for. BeWeather for the PlayBook PlayBook is an excellent example of how developers and designers can work together. While I did mention a few things that could be changed the overall application experience is quite excellent. I hope that a Native PlayBook version is in the works. BeWeather is available for the BlackBerry PlayBook and sells for $4.99. You can grab the link below and pick it up from BlackBerry App World. One issue was the app requested to be closed a few times while I was reviewing it. Does not have auto detection for your current location, not a deal breaker but a nice feature to have.